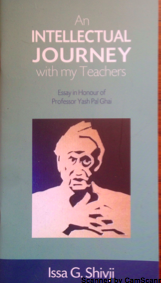 Excerpt: Professor Yash Pal Ghai was my teacher. He took some classes, I believe in Constitutional Law and Legal Systems of East Africa, in my first year at the University College, Dar es Salaam, which was then one of the three constituent colleges of the University of East Africa. Writing an essay in honour of your teacher is humbling. I come from a tradition in which teachers command great respect. In the hierarchy of status and obeisance, teachers are next to parents who are next to God. I thus take this opportunity to honour all my teachers, some of whose memory I recall in this essay. I remember once Ghai asking me rhetorically: Do you always write long papers? The way he said it, it was meant to be a complement. That happened as Ghai was coming down the library staircase during lunch hour, carrying volumes of books in both his arms. His feet were typically clad in kanda-mbili (flip-flops). That image of Ghai is permanently etched in my memory as an example of a prodigious, yet humble scholar wholly committed to research and writing. While memories last, I should perhaps record another pleasant encounter with Yash while I was still a student. I believe I was in my second year when Yash asked me if I could help him to check the footnotes of his co-authored book Public Law and Political Change in Kenya. He had just received the galleys. It was a massive book, a magnum opus of his and Patrick McAuslan's. I readily agreed. My library research to verify footnotes introduced me to all kinds of literature which I had not come across before as a law student nor did I know existed in our library. I believe I did the work meticulously, for which Yash apologetically offered me shs.100/=. For me it was a lot of money, one-fourth of my yearly book allowance. It fetched me five good Penguin books... The full essay can be downloaded here.